Greece is a country rich in tasty and unique foods, and eating is a large part of the culture, as well. So visiting without trying a wide variety of the foods would be to miss out on a major part of the culture and history of Greece. We always recommend you try as many different foods as possible, so we’ve put together this list of foods you must eat in Greece as a guide to help you remember the top list of foods to look for. To make it even easier on yourself, you could book a guided food tour with Greeking.me. There are many influences from other Mediterranean countries nearby, like Italy and Turkey, but just as Greek coffee is similar to Turkish coffee, yet not quite the same, so is the cuisine. You may find a few of these dishes are ones you’ve come across in other nearby countries, but the Greek version is still worth trying, because there are quite a few variances. ⇒ Planning to spend time in Athens? Check out our Shortcut Travel Guide to Athens with all you need to know to plan your trip: where to stay, where to eat, what to do. All in one fun-to-read infographic. ⇒ Looking for a Greece food tour? Try this 4-day gourmet culinary tour in Athens – it includes a food and city tour and cooking lessons! Without further ado, here are the top 15 foods you must eat in Greece. Moussaka is an eggplant and ground meat cassarole-like dish with a tomato base that is bound together with by a creamy layer of bechamel sauce on top. It is most typically served as a lunch dish, but can be found on many dinner menus as well. It is likely you’ll find many different variations of this dish, as most families have their own distinct recipe. If you don’t find one you like the first time, it’s always worth trying it again somewhere else. It’s quite likely you’ve already had a gyro or two before coming to Greece. It is a handheld pita sandwich that is loved around the world. You can get it with a variety of different meats, including beef, lamb, chicken and pork. In Greece, it is often served with french fries and veggies packed inside and a tangy tzatziki sauce on top. The best part about gyros are that they are often a cheap and fast alternative when you’re in a hurry or don’t want to sit down at a restaurant for long. 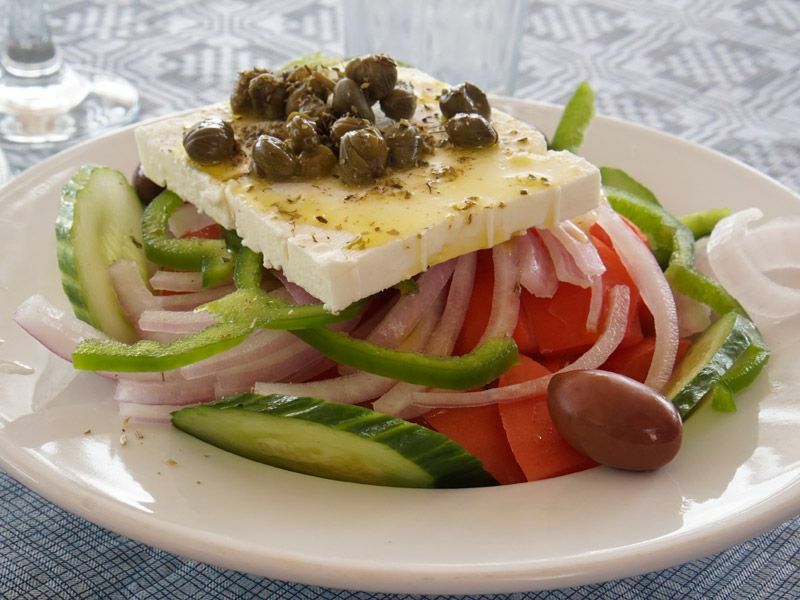 Yes, I know, you’ve had a Greek Salad before, but you probably haven’t had it the prepared the “right” way, which is to say the way the Greek prepare it. A traditional Greek salad (also called Horiatiki) includes tomato, cucumber, green pepper, red onion, Kalamata olives and a rather large brick of feta cheese on top. It’s so fresh and light, that it’s hard to resist ordering it. If you like cheese, you’re going to fall in love with saganaki and want to order it as a starter before every meal. It’s really just fried cheese. It is named for the frying pan it is made in. I wanted to make it at home so I set about trying to find what cheese was used, when I found out that it can be made with a few different types of Greek cheese that can withstand high heat before melting, like halloumi, kasseri or graviera. Keftedes are Greek fried meatballs. They’re usually served as an appetizer just with some tomato sauce poured over the top, but can be found as a more substantial dish with rice. You might also see this word tacked onto the end of other dishes, like Revithiakeftedes (fried chickpea balls) or Domatokeftedes (fried tomato fritters). Another popular dish for lunch is Soutzoukakia me Hilopitakia, which is another form of meatballs served on top of egg pasta with tomato sauce. Think of it as the Greek version of spaghetti and meatballs. You may have had these before – usually from a jar you can buy at the grocery. It’s a rice and herb-stuffed grape leaf, usually served as an appetizer or part of a mezze platter. I’ve eaten them many times, but never handmade, and let me just say, they are way better than anything you can get at the store. One of my favorite dishes to order for dinner is souvlaki. We’ve even made it here at Savored Journeys for our international cooking series. If you want the recipe, check here. Lamb souvlaki is marinated and grilled, making it so tender and flavorful. It’s often served with rice or pita and eaten alongside a greek salad. If you have a sweet tooth, you will love these little doughnuts. They’re fried and crispy on the outside, but light and fluffy in the middle. They are also dusted with cinnamon and smothered in honey, so be prepared for the serious sugar boost you’ll get from eating just one! you can sometimes also find them sprinkled with nuts. 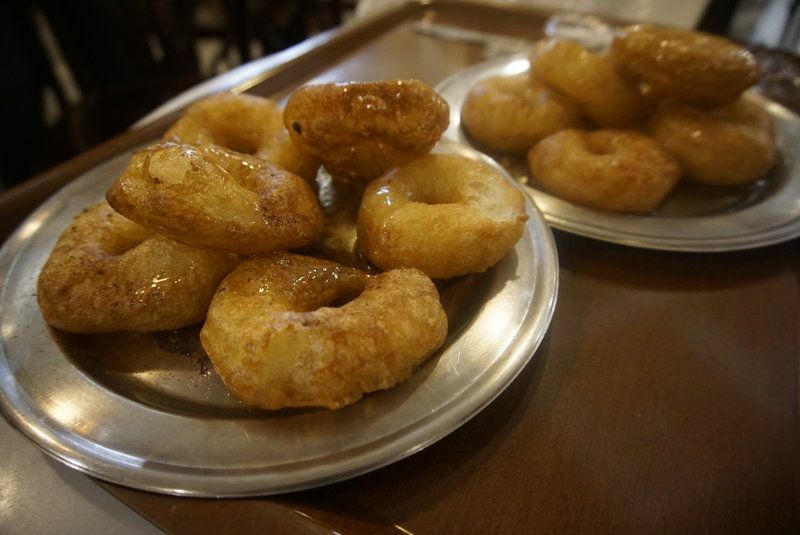 A traditional Greek street food, koulouria is likely the first thing you’ll see upon entering the city, because there are often many street stands selling it. It’s great for tourist because you can just grab one and walk around with it for a snack, but you’ll find that the locals mostly eat it for breakfast. 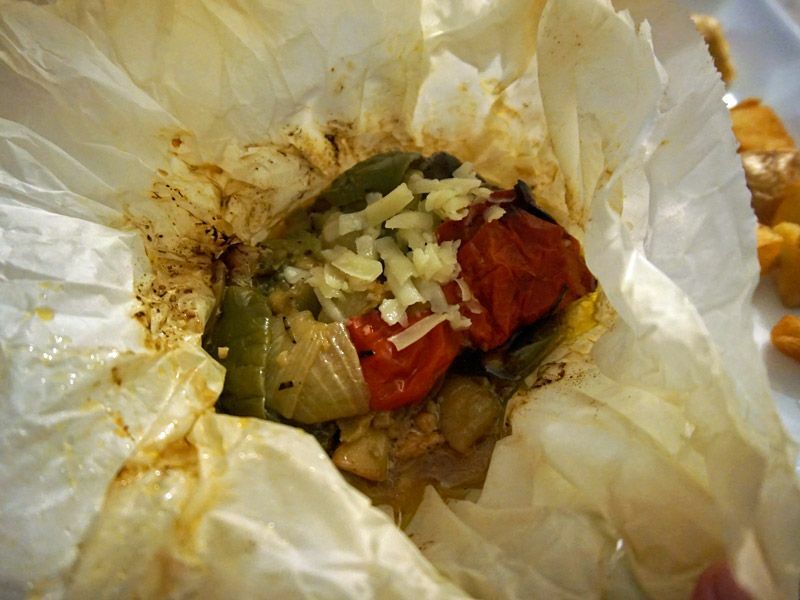 Lamb Kleftiko is a delicious stewed dish made by sealing the lamb and accountraments up into a parcel of parchment paper. Once it’s been cooked for hours, the stew inside the packet is so tender and the flavors are all melded together. It’s a great dish to order on a chilly fall evening. It’s really a universal sauce in Greek cuisine. Made from Greek yogurt, garlic, lemon and dill combined together, then drizzled with olive oil and dressed with some olives, the sauce can be eaten along on pita, or scoped onto just about anything you want to eat. We saw so many pie shops in Athens selling these hand pies. They are made from either filo dough stuffed with feta or another savory filling, or they are of a firmer dough, stuffed with the same ingredients. They are very popular cafe snacks. 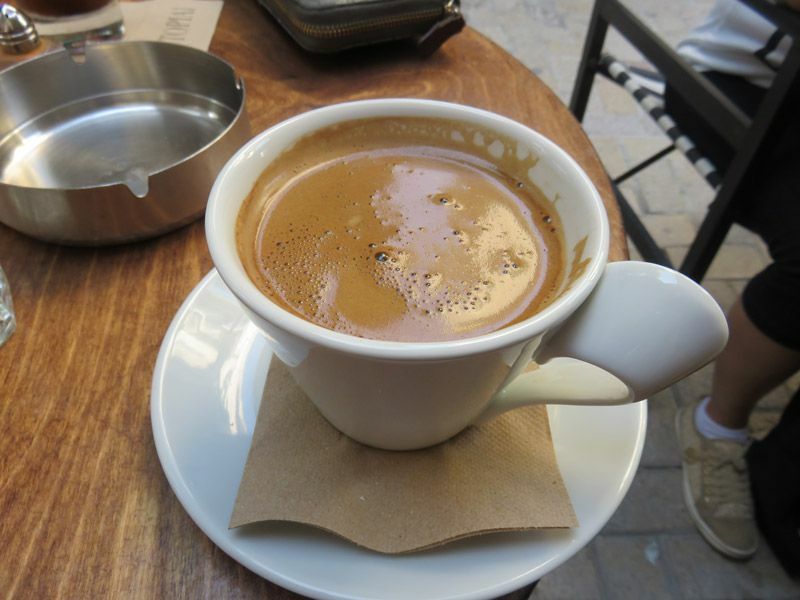 Very similar to Turkish coffee, if you’ve had that, Greek coffee is just as thick, but not as roasted. It is made by mixing roasted, finely ground coffee beans with water and heating very slowly on the stove. The result is a thicker than American coffee drink that has a thick layer of unincorporated grounds at the bottom of the cup. Santorini is home to a large amount of the wine produced in Greece. 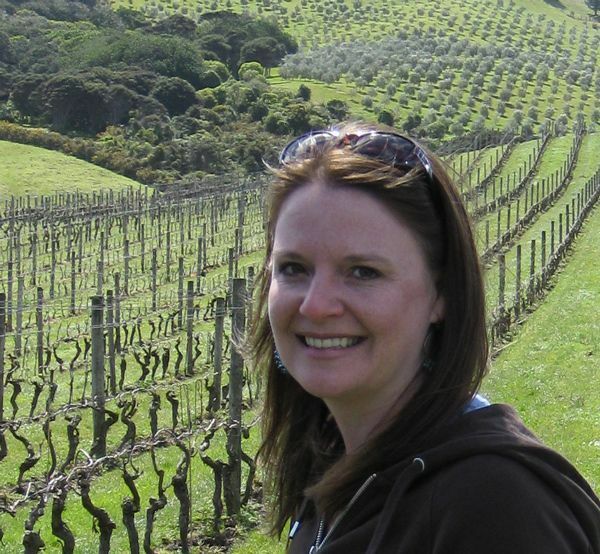 A wine tour to the vineyards around the island is a good way to taste the unique varietals found on Santorini and learn a bit about the way they grow their grapes on such volcanic soil and in high winds. 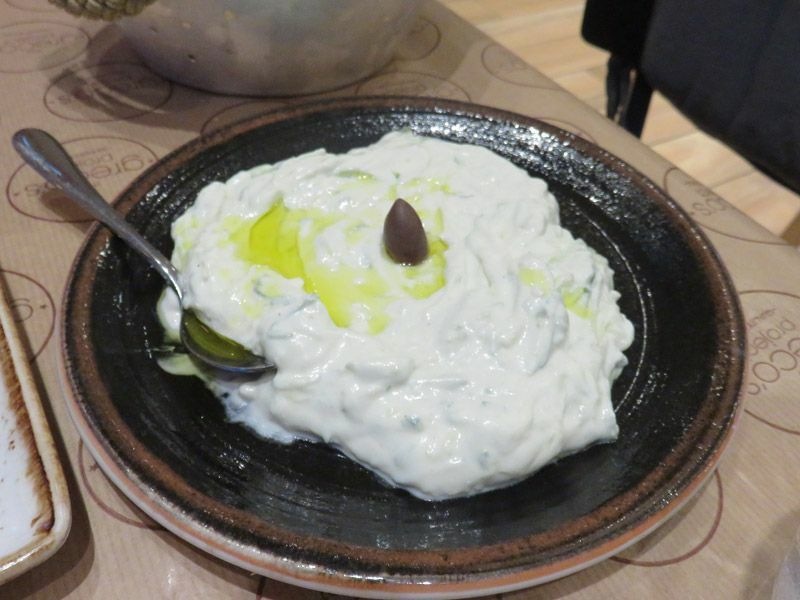 This is just a start to the incredible list of the foods you must eat and drink in Greece, but it’s a great start to learning a bit about the flavors and culture of food. What are your favorite things to eat in Greece? Traveling to Greece and want to go island hopping? Check out our guide to taking Greek ferries. Like this post? Why not share this image on your Pinterest board? This entry was posted in Food and tagged food, Greece.